, a very eminent poet, was the son of a minister in Scotland, and born at Ednam in the shire of Roxburgh, Sept. the llth, 1700. His mothers name | was Beatrix Trotter, and not Hume, as Dr. Johnson says, Hume being the name of his grandmother. His father was minister of Ednam, with a family of nine children. A neighbouring clergyman, Mr. Riccarton, discovering in James uncommon promises of future excellence, undertook to give him instructions, and provide him with books; and, after the usual course of school education at Jedburgh, he was sent to the university of Edinburgh. In the second year of his admission, his studies were for some time interrupted by the death of his lather; but his mother soon after repaired with her family, which was very numerous, to Edinburgh, where she lived in a decent and frugal manner, till her favourite son had not only finished his academical course, but was even distinguished and patronized as a man of genius. Though the study of poetry was about this time become general in Scotland, the best English authors being universally read, and imitations of them attempted, yet taste had made little progress; the major part criticized according to rules and forms, and thus were very able to discern the inaccuracies of a poet, while all his fire and enthusiasm escaped their notice. Thomson believed that he deserved better judges than these, and therefore began to turn his views towards London, to which an accident soon after entirely determined him. 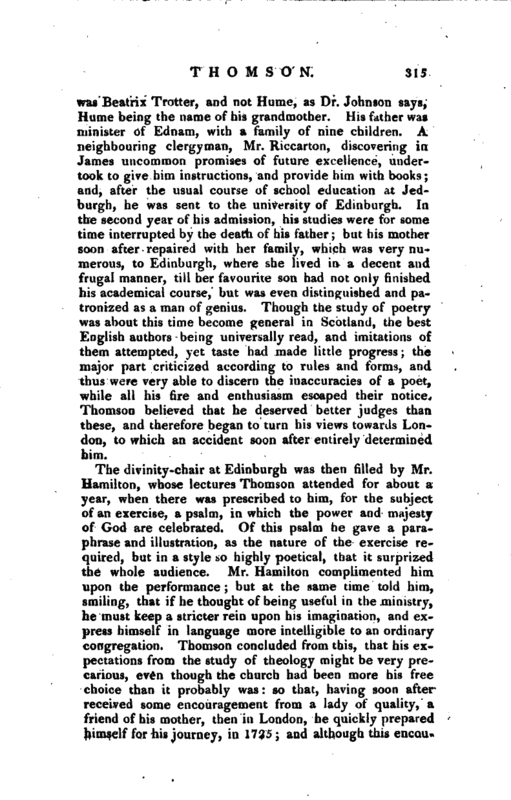 The divinity-chair at Edinburgh was then filled by Mr. Hamilton, whose lectures Thomson attended for about a year, when there was prescribed to him, for the subject of an exercise, a psalm, in which the power and majesty of God are celebrated. Of this psalm he gave a paraphrase and illustration, as the nature of the exercise required, but in a style *o highly poetical, that it surprized the whole audience. Mr. Hamilton complimented him upon the performance; but at the same time told him, smiling, that if he thought of being useful in the ministry, he must keep a stricter rein upon his imagination, and express himself in language more intelligible to an ordinary congregation. Thomson concluded from this, that‘ his expectations from the study of theology mi^ht be very precarious, even though the church had been more his free choice than it probably was: so that, having soon after received some encouragement from a lady of quality, a friend of his mother, then in London, he quickly prepared himself for his journey, in 1725; and although this | encauragement ended in nothing beneficial, it served then for a good pretext, to cover the imprudence of committing himself to the wide world, unfriended and unpatronized, and with the slender stock of money he possessed. But his merit did not lie long concealed. Mr. Forbes, afterwards lord-president of the session, received him very kindly, and recommended him to some of his friends, particularly to Mr. Aikinan, whose premature death he has with great affection commemorated, in a copy of verses written on that occasion. The good reception he experienced wherever he was introduced, emboldened him to risque the publication of his “Winter,” in March 1726, which was no sooner read than universally admired; and from that time his acquaintance was courted by all men of taste. Dr. Ilundle, afterwards bishop of Derry, received him into his intimate confidence and friendship; promoted his reputation every where; introduced him to his great friend the lord chancellor Talbot; and some years after, when the eldest son of that nobleman was to make his tour of travelling, recommended Mr. Thomson as a proper companion for him. His affection and gratitude to Dr. Rundle are finely expressed in his poem to the memory of lord Talbot. 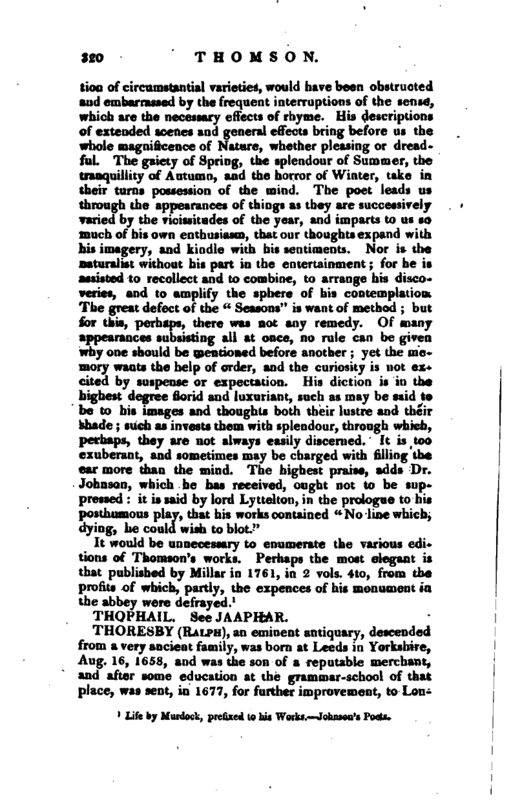 In the mean time, the poet’s chief care had been, in return for the public favour, to finish the plan which their wishes laid out for him; and the expectations which his “Winter” had raised were fully satisfied by the successive publication of the other seasons; of “Summer,” in 1727; of “Spring,” in 1728; and of “Autumn,” in a 4to edition of his works, in 1730. Some very interesting remarks on the variations introduced into these, in subsequent editions, may be seen in the Ceusura Literaria, vols. II. III. and IV. 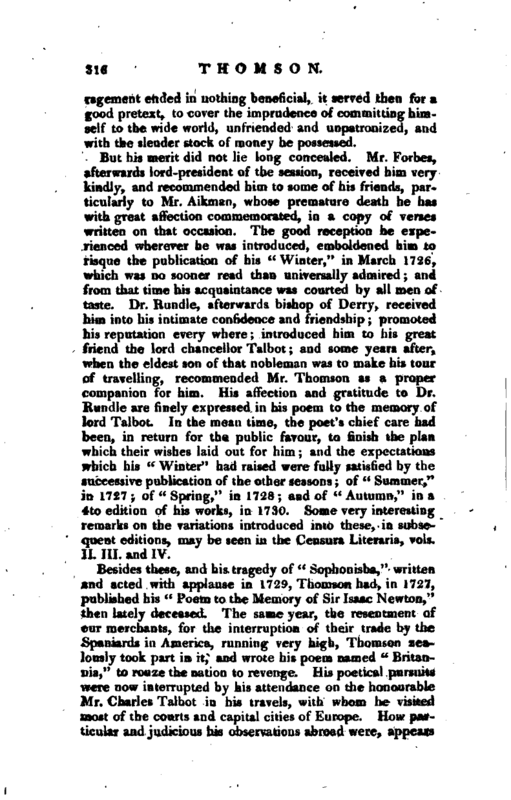 Besides these, and his tragedy of “Sophonisba,” written and acted with applause in 1729, Thomson had, in 1727, published his “Poem to the Memory of Sir Isaac Newton,” then lately deceased. The same year, the resentment of our merchants, for the interruption of their trade by the Spaniards in America, running very high, Thomson zealously took part in it, and wrote his poem named “Britannia, to rouzethe nation to revenge. His poetical pursuits were now interrupted by his attendance on the honourable Mr. Charles Talbot in his travels, with whom he visited most of the courts and capital cities of Europe. 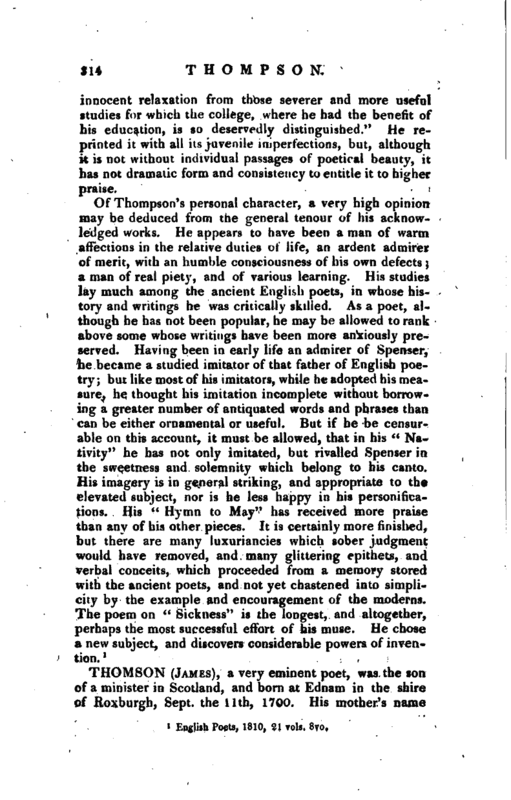 How particular and judicious his observations abroad were, appears | from his poem on” Liberty,“in five parts, thus entitled,” Ancient and modern Italy compared“” Greece’“”Rome;“” Britain;“” The Prospect.“While he was writing the first part of” Liberty,“he received a severe shock, by the death of his noble friend and fellow-traveller; and this was soon followed by another still more severe, and of more general concern, the death of lord Talbot himself; which Thomson so pathetically laments, in the poem dedicated to his memory. At the same time, he found himself from an easy competency reduced to a state of precarious dependence, in which he passed the remainder of his life, excepting only the two last years of it; during which he enjoyed the place of surveyor-general of the Leeward islands, procured for him by the generous friendship of lord Lyttelton. Immediately upon his return to England with Mr. Talbot, the chancellor had made him his secretary of briefs, a place of little attendance, suiting his retired indolent way of life, and equal to all his wants. This place fell with his patron; yet could not his genius be depressed, or his temper x hurt, by this reverse of fortune. He resumed, in time, his usual cheerfulness, and never abated one article in his way of living, which, though, simple, was genial and elegant The profits arising from his works were not inconsiderable; his” Tragedy of Agamemnon," acted in 1738, yielded a good sum. But his chief dependence, during this long interval, was on the protection and bounty of his royal highness Frederic prince of Wales, who, upon the recommendation of lord Lyttelton, then his chief favourite, settled on him an handsome allowance, and always received him very graciously. 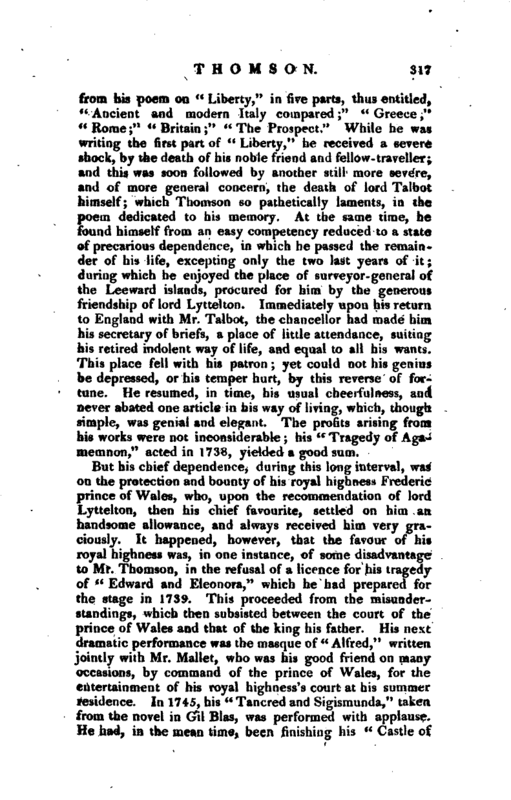 It happened, however, that the favour of his royal highness was, in one instance, of some disadvantage to Mr. Thomson, in the refusal of a licence for his tragedy of “Edward and Eleonora,” which he had prepared for the stage in 1739. This proceeded from the misunderstandings, which then subsisted between the court of the prince of Wales and that of the king his father. His next dramatic performance was the masque of “Alfred,”' written, jointly with Mr. Mallet, who was his good friend on many occasions, by command of the prince of Wales, for the entertainment of his royal highness’s court at his summer residence. In 1745, his “Tancred and Sigismunda,” taken from the novel in Gil Bias, was performed with applause. He had, in the mean time, been finishing his “Castle of | Indolence,” an allegorical poem, in two cantos the stanza which he uses in this work is that of Spenser, borrowed from the Italian poets. 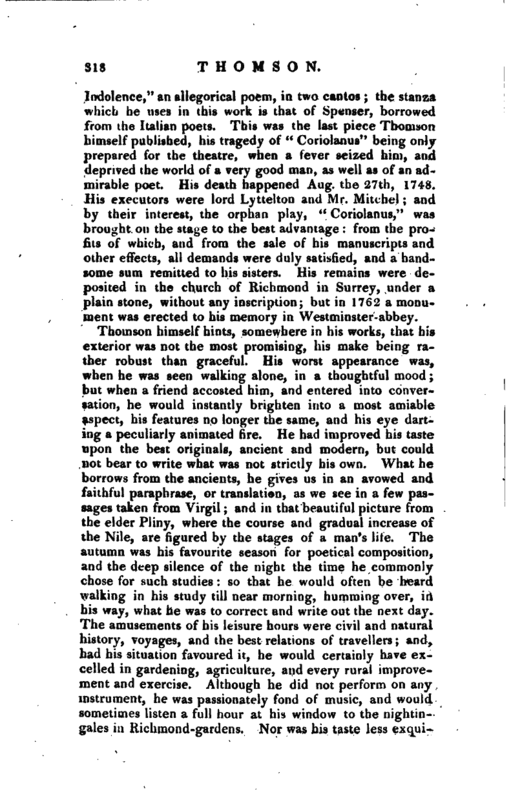 This was the last piece Thomson himself published, his tragedy of “Coriolanus” heing only prepared for the theatre, when a fever seized him, and deprived the world of a very good man, as well as of an admirable poet. His death happened Aug. the 27th, 1748. His executors were lord Lyttelton and Mr. Mitchel; and by their interest, the orphan play, “Coriolanus,” was brought on the sta e to the best advantage: from the profits of which, and from the sale of his manuscripts and other effects, all demands were duly satisfied, and a handsome sum remitted to his sisters. His remains were deposited in the church of Richmond in Surrey, under a plain stone, without any inscription; but in 1762 a monument was erected to his memory in Westminster-abbey. Thomson himself hints, somewhere in his works, that his exterior was not the most promising, his make being rather robust than graceful. His worst appearance was, when he was seen walking alone, in a thoughtful mood; but when a friend accosted him, and entered into conversation, he would instantly brighten ^ito a most amiable aspect, his features no longer the same, and his eye darting a peculiarly animated fire. He had improved his taste upon the best originals, ancient and modern, but could not bear to write what was not strictly his own. What he borrows from the ancients, he gives us in an avowed and faithful paraphrase, or translation, as we see in a few passages taken from Virgil; and in that beautiful picture from the el<!er Pliny, where the course and gradual increase of the Nile, are figured by the stages of a man’s life. 1 he autumn was his favourite season for poetical composition, and the deep silence of the night the time he commonly chose for such studies: so that he would often be heard walking in his study till near morning, humming over, in his way, what he was to correct and write out the next day. The amusements of his leisure hours were civil and natural history, voyages, and the best relations of travellers; and, had his situation favoured it, he would certainly have excelled in gardening, agricultuie, and every rural improvement and exercise. Although he did not perform on any instrument, he was passionately fond of music, and would sometimes listen a full hour at his window to the nightingales in Richmond-gardens. Nor was his taste less | exquisite in the arts of painting, sculpture, and architecture. In his tr.vels, he had seen all the most celebrated monuments of antiquity, a.id the best productions of modern art, and had studied them so minutely, and with so true a judgment, that, in some of his descriptions in the poem of “Liberty,” we have the masterpieces, there mentioned, placed in a stronger light than many visitors can see them witii their own eyes. A* for the more distinguishing qualities of his mind and heart, they are better represented in his writings, than they can be by the pen of any biographer. There his love of mankind, of his country, and friends; his devotion to the Supreme Being, founded- on the most elevated and just conceptions of his operations and providence, shine out in every page. So unbounded was his tenderness of heart, that it took in even the brute creation: he was extremely tender towards his own species. He is not indeed known, through his whole life, to have given any person one moment’s pain by his writings, or otherwise. He touk no part in the poetical- squabbles of his time, and so was respected and left undisturbed by both sides. These virtues did not fail to receive their due reward. The best and greatest men of his time honoured him with their friendship and protection; the app’ause of the. public attended all his productions; his friends loved him with an enthusiastic ardour, and sincerely lamented his untimely death. 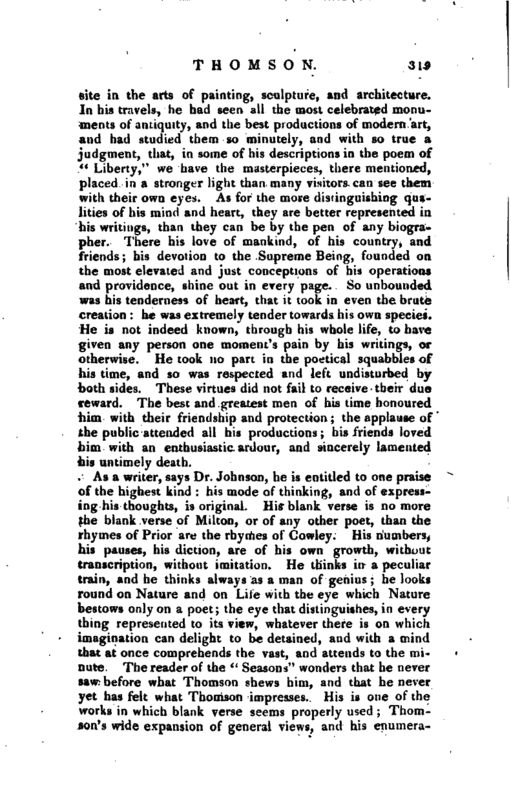 Life by Murdock, prefixed to his Works.—Johnson’s Poets.